International Medical Corps (IMC) in a consortium with World Vision and a local faith based organization -St. Joseph Shelter of Hope is implementing a European Union funded project called Integrated Maternal Child Health, Nutrition and Family planning in Taita Taveta County .International Medical Corps is coordinating nutrition activities in the county. Taita Taveta is one of the Arid and Semi-Arid Lands counties in Kenya facing chronic food insecurity. According to November 2013 nutrition surveys, stunting rate for children less than five years of age was 27%. Some of the underlying factors include, poor dietary diversity among the children under two years of age is at 23%, with high consumption of cereals and starches and low consumption of eggs, meat, poultry and fruits. Vitamin A supplementation for children -under five years of age also rated low, at 29% as well as deworming rate of 21.7%. 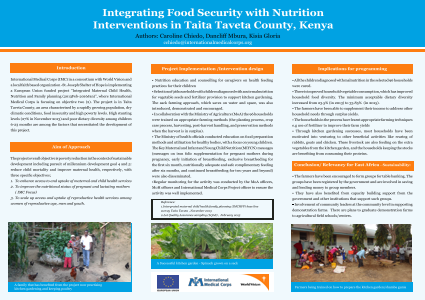 The findings demonstrated the necessity to improve knowledge of nutrition and child feeding and support for households to improve their dietary diversity through food security Interventions. The project initially targeted households with a child diagnosed with acute malnutrition, and provided nutrition education and counseling for caregivers on healthy feeding practices for their children. Later, 96 households with malnourished children were also supported with seeds and fertilizer to start kitchen gardens around their homesteads. International Medical Corps staff teamed up with Ministry of Agriculture officials to train households on appropriate farming methods; the planting process, harvesting, post-harvest stages, preparation and food preservation methods when the harvest is surplus. Sack farming approach, which saves on water and space was also introduced, demonstrated and encouraged. Each household was provided with one kilogram of cow-peas and beans spinach seeds, kale seeds and manage seeds, as well as fertilizers. The beneficiaries were encouraged to set up communal nurseries. The beneficiaries had tremendous successes and more households expressed interest to establish their own kitchen gardens. By February 2015, 500households had set up kitchen gardens around their homesteads. Antenatal mothers diagnosed with low hemoglobin levels were also supported to grow variety of vegetables for their own consumption. Nutrition education was also provided to these households by the nutritionists and the health workers. Extensive agricultural support including on-job training and regular monitoring of the progress, and technical support was provided through the Ministry of Agriculture. The Ministry of Health through the nutrition and community health departments was involved during the selection of beneficiaries and in monitoring the nutrition- food security linkages as well as health indicators. Out of the 96 targeted households, only 9 households had acutely malnourished children by end of April 2015. Support is on-going for the 9 households to ensure complete recovery of the children. Fewer cases of malnutrition are being reported at the health facilities. Most beneficiaries have testified that kitchen gardening has improved their households’ vegetable consumption. One elderly beneficiary said that when he introduced the ‘shamba gunia’ at their home, his wife did not understand the technology and therefore did not appreciate her husband’s efforts. However, after the first good harvest, she embraced the technology as it saved a lot of time that she had previously spent going to the market. The farmers are also reaping other economic benefit from the program. Most of them have indicated that they are selling extra vegetables to meet other needs within the households including purchasing soap, cooking oil, salt, etc. One mother indicated she was given a tender to supply vegetables worth Ksh 20 per day at a nearby school. Another beneficiary said that the has learnt to use fertilizer to improve her farm yield not only in kitchen gardening but also other farming endeavor’s such as maize farming. The family consumes part of the maize produce and sells the rest to pay school fees. Another beneficiary used proceeds from the kitchen gardening to supplement his income through which he was able to the construct a permanent family house. The farmer has since moved the newly constructed house with his family. The project has ensured sustainability of these interventions by encouraging farmers to form groups for table banking. The groups have been registered by the government and are involved in saving and lending money to group members. The groups currently have a combined savings of 132,000/-. They have also benefited from capacity building support from the government and other institutions that support such groups. The groups are currently drafting proposals for support to start other income generating activities like rabbit keeping, poultry keeping and bee keeping. At the community level, the chiefs are involved in supporting the demonstration farms at the nearby schools and churches. Plans are underway to graduate demonstration farms to agricultural field schools/centers.